There are not many villages that are able to get their act together and develop an attraction for foreign and local tourist alike. But the villages of Kampung Notoruss in the penampang district have come up with a super product /attraction by incorporating their unique culture together with conservation to turn their village into a must visit attraction .It is also known as the Tagal tinopikon park .The village is located by the banks of the moyog river in Penampang. This is just about 18 km from the city of Kota Kinabalu. And it is only 12km from the township of Donggongon , which is the heartland of the kadazanDusun people of Sabah. Tagal is a kadazan/Dusun word that means prohibited. This is usually used as a means of conserving the fish in the rivers. Usually a section of the river will be under Tagal for a year or two to allow the wild fish in the river to grow to a suitable size for eating and breeding. There are many sections of various rivers in Sabah today under this system, which is also encouraged by the Government. Besides a no fishing zone, the trees on the river bank are not to be cut down and no littering is allowed . People or villages who do not respect a river which is under Tagal , will face being fined by the village heads if they are caught. The suspension bridge that leads to the village. Due to the section of the river under tagal, fronting the village in Notoruss, the area has been turned into a beautiful park. The entrance to the village is a only 5 minutes walk from the main road across a suspension bridge to the opposite bank of the Moyog river which is the main reception area. 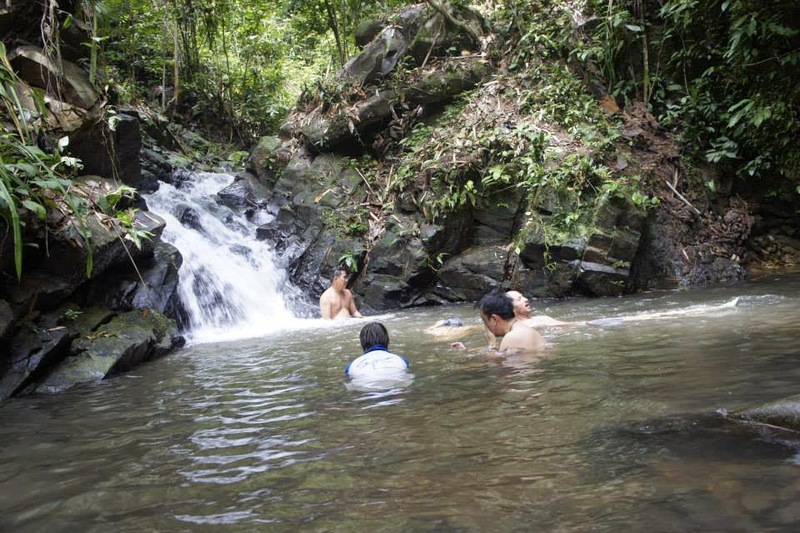 The Villagers here have come up with a program that showcases their unique heritage in visits to their fruit orchards, a fish spa, jungle treks to waterfalls, their food and culture. A traditional house built of bamboo that is over 100 years old. The program is in divided into 2 half-day programs in collaboration with a local tour company in Kota Kinabalu. (AJ Best) is the authorized operator who offers this 3.5-hour experience (9:30am-1pm and 2 .00pm to 6.00pm) to visit the Tinopikon Park area. 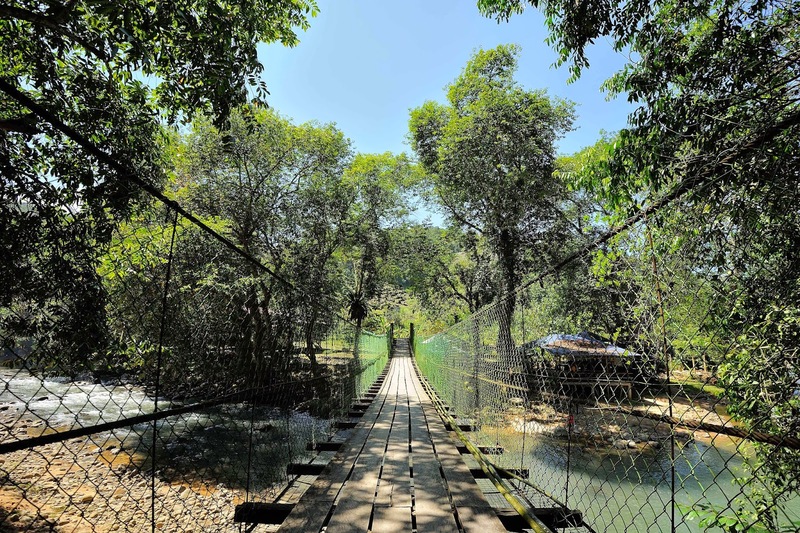 Upon arrival at the park /village, visitors will be introduced to the local guides and rangers who will proceed with a briefing before leading you on a tour through the village, past fruit orchards and into the jungle for a short trek to a waterfall. You will also have the chance to try your hand at tapping rubber that is one of the cash crops of the villagers. At the waterfalls you may have a dip in the cool waters if you so wish. Upon returning to the reception area, a welcome of delicious local food awaits you for lunch or an early dinner. The local ladies of the village using whatever local vegetables are in season prepare the food here. These dishes give off a truly incredible aroma as they are all cooked over traditional wood fires. During your meal you will be further entertained with traditional gong music and Sumazau dance. After your meal you will have time to swim in the river or get a gentle massage from the fish in the fish spa.